end of this lever is connected with a small helical spring ,s\ There are eighty such elements arranged in a row, as shown in Fig. 50. 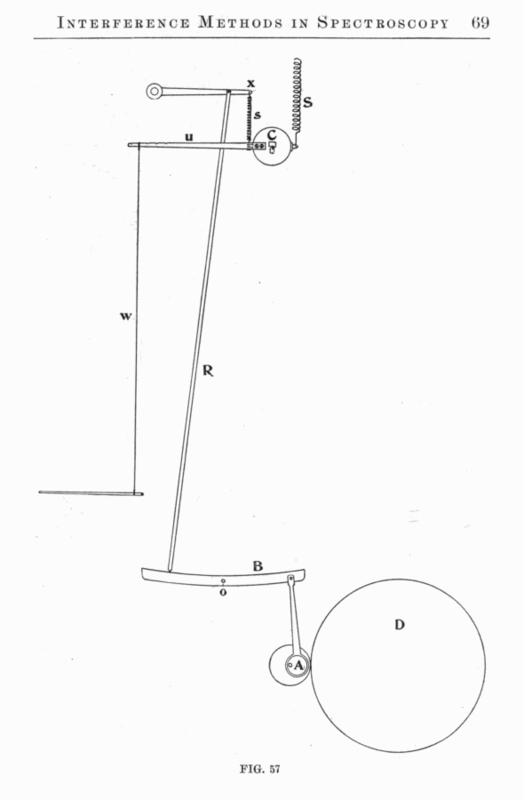 In order to add the force of all of the springs, they are connected with the drum C, which can turn about its axis, and counterbalanced by a very much larger spring S connected to the other side of the drum. This gives us the means of adding forces which are proportional to the amount of displacement of the lever below, and hence the sum of the forces of these eighty springs is in direct proportion (at any rate to a close degree of approximation) to the sum of the motions themselves. We have thus a mechanical device for adding simple harmonic motions. 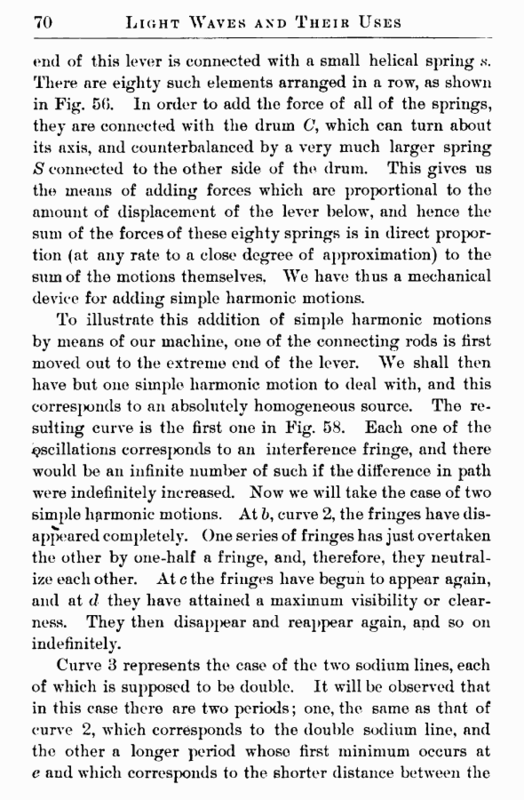 To illustrate this addition of simple harmonic motions by means of our machine, one of the connecting rods is first moved out to the extreme end of the lever. We shall then have but one simple harmonic motion to deal with, and this corresponds to an absolutely homogeneous source. The resulting curve is the first one in Fig. 58. Each one of the oscillations corres[>onds to an interference fringe, and there would be an infinite number of such if the difference in path were indefinitely increased. Now we will take the case of two simple harmonic motions. At b, curve 2, the fringes have disappeared completely. One series of fringes has just overtaken the other by one-half a fringe, and, therefore, they neutralize each other. At c the fringes have begun to appear again, and at d they have attained a maximum visibility or clearness. They then disapj>ear and reappear again, and so on indefinitely.